This room is a beautifully adorned corner room that is generously sized and bright and cheerful with large 10’ windows framed in original redwood molding, featuring bay windows, a sitting area, 14’ high ceilings, antique armoire and a king size bed. 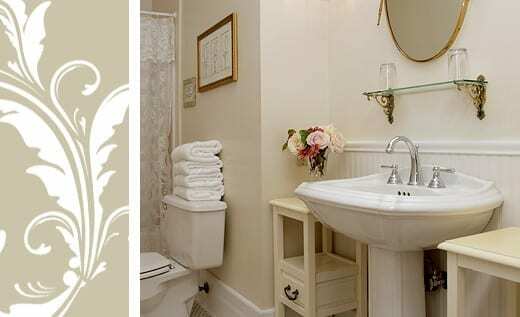 The private bath has a pedestal sink and a traditional tub and shower. This romantic room is our most private and popular.